A vacancy notification about Kolkata metro rail recruitment has recently been advertised for informing the skilled and well-qualified claimants for the 06 vacancies of Sports Personnel by the Kolkata Metro Rail. Eligible candidates can apply for Kolkata Metro Railway vacancy by submitting applications through offline mode before the last date of 25th January, 2019. Education criteria: Those seeking job should complete the education as per 10th / ITI / 12th recognized posts as well as good academic records from recognized board / university / institution. Candidates will be eligible for SC / ST / Female / minority / and financially backward classes for Rs. 250 / - as application fee. The age of the claimants should be between 18 and 25 years on 01-01-2019. Pay band for Kolkata Metro Rail Jobs: Candidates applying for Sports Person posts will get remuneration of rupees. 5200 - 20,200 / - 1900/2000 / - with Grade Pay, which is offered by Kolkata Metro Rail. The organization can organize trials and personal interviews for shortlisting favorable claimants. First, contact the Kolkata Metro Rail web portal, which is http://www.mtp.indianrailways.gov.in. It will open a list of latest opening links and candidates will have to select the most appropriate link, which will open the entire advertisement with more information about Kolkata Metro Rail Vacancies. The last date for submission of hard copy of the application form is: 25-01-2019. 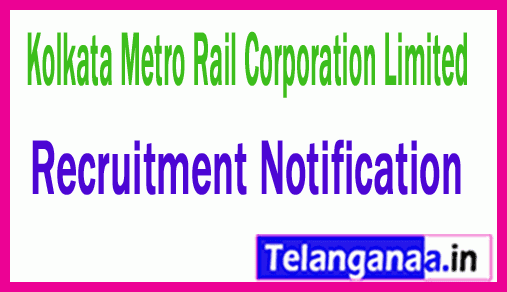 Click Kolkata Metro Rail Recruitment Notification here. Kolkata Metro Rail Corporation Limited (KMRC) invites application for the post of 17 Trade Apprentice for the year 2017-18. Apply before 24 January 2017. Educational Qualification - Candidates should possess Matriculation (Matriculate or 10th Class in 10+2 examination ystem) with minimum 50% on average & ITI certificate from any institute affiliated to NCVT in relevant trade. Selection Process- Candidates will be selected based on merit, verification of the original testimonials and their physical fitness. Application Fee - Candidates have to pay Rs. 40/- through Crossed IPO in favour of FA & CAO, Metro Railway, Kolkata, payable at GPO/ Kolkata. No fee for SC/ ST/ PH/ Women/ Minorities and Economically Backward candidates. How to Apply - Interested candidates may apply in prescribed application form along with all copies of all relevant certificates attested by gazetted officer, two self addressed envelops (10″x5″), one signed recent passport size photograph send by post to the Dy. Chief Personal Officer, Metro Rail Bhavan, 33/ 1, J.L, Nehru Road, Kolkata-700071 or drop in the Box kept in P.R.O Section, Metro Rail Bhavan, 33/ 1, J.L, Nehru Road, Kolkata-700071 on or before 24.01.2017.